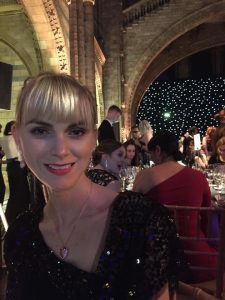 “Just last month I had the honour of attending the European Diversity Award at the Natural History Museum in London after being shortlisted down to the final six for the Campaigner Of The Year Award which was just out of this world and incredible both for me and for Lyme disease as an illness. My category was tough with OBEs and MBEs making the shortlist. It didn’t scare me, however. Of course I prayed and hoped to win, knowing and understanding the international platform it would give LDUK as a community and Lyme disease sufferers around the world. I have given my all to my campaigning work this year. I have worked endlessly and exhausted most of the ideas I came up with, in the hope that I could raise as much awareness as humanly possible. I felt a weight on my shoulders, not placed there by anyone else but myself. I wanted to give all our members a voice and the motivation that change is on the horizon. We are getting recognised on the global stage and just because we are poorly, it doesn’t mean we can’t live and achieve our dreams. I may not have come away with the trophy, or the official title of a winner. However, I still came away as a winner in many ways. Getting to speak to the celebrities in attendance such as Sophie Ward (the actress!) and Sinitta, who knew who I was and who wanted to know more about Lyme disease, was just incredible. They invited me to join in with pictures with other guests, ensuring that the main photographer did the shooting. This meant so much to me. Then for Sophie Ward to stand up and say my name in my category followed by ‘The better Sophie Ward!’ Well, I mean come on, she is a legend in her own right! Their kindness and belief in me and encouragement to keep going said a lot. We as a Lyme disease community are leaving our mark. We are sticking in people’s minds and being remembered. This kind of acceptance is so important because the more people within society as a whole who can get their heads around Lyme disease, understand the disease, believe the disease and educate themselves then the faster change will begin to happen because we can no longer be dismissed and ignored. The evidence and support will be far too strong. LDUK has achieved the most successful campaign year YET in 2018 which is amazing. We have collectively, as a community, been out on the front lines and we must remember that every little helps. Nobody should shy away or feel as if they can’t campaign. It isn’t all about media work, protests, writing endless letters – the small things make a huge difference too. Word of month is one of the BEST forms of campaigning. Leaflet dropping and putting up posters are also effective ways of spreading the word. I hope that I can offer some motivation and inspiration that it is possible to do our bit in our own special way and that we ARE being heard. I was always Miss Invisible at school and so under-confident. If you had told me, even 12 months ago, that I would be campaigning on the radio, on the TV and in newspapers and magazines, I would have probably laughed at the thought. I would never have thought that little old me, Sophie Ward, could possibly speak to cameras or on a microphone. I am still under-confident and shy so don’t get me wrong but when it comes to campaigning I put my fears to one side. They won’t stop me from speaking out for the thousands of us who feel like we are being ignored and dismissed. I am so passionate about protecting and saving lives, even more than saving my own. I campaign so hard to protect others. I hope I am proof that we can overcome so much, that we are stronger than we believe and when anything is done with the heart and with passion, it really does unlock so many doors. You touch and reach more people, people can relate, people start to understand and with all that come acceptance and change. A win at the European Diversity Awards would have been what dreams are made of and a fabulous way to end a successful year. However, we can’t be greedy and we must leave room for improvement. We have an exciting 2019 ahead with many more experiences, opportunities and adventures in the pipeline at LDUK. We must keep striving to better ourselves and to inspire ourselves. Having dreams is not crazy and we deserve them and need them to motivate ourselves to keep working hard. I am so grateful for 2018 in everyway and I am so lucky to have the support of LDUK. A big thank you must be said for the LDUK admin team who are my second family and very close friends. They are always on hand to offer advice and support to me and to the community. They are so kind-hearted and their loving messages and encouragement have inspired me to keep fighting through the dark days, to bounce back after I have a blip and most importantly, to believe in myself. Always believe in yourself – you are unstoppable. You deserve life and you deserve to achieve your dreams. Failures are never failures, just lessons from which to grow and improve. « How Has LDUK Helped You?